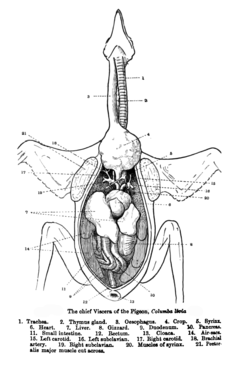 The gizzard, also referred to as the ventriculus, gastric mill, and gigerium, is an organ found in the digestive tract of some animals, including archosaurs (dinosaurs including birds, pterosaurs, crocodiles and alligators), earthworms, some gastropods, some fish and some crustaceans. This specialized stomach constructed of thick muscular walls is used for grinding up food, often aided by particles of stone or grit. In certain insects and molluscs, the gizzard features chitinous plates or teeth. The word gizzard comes from the Middle English giser, which derives from a similar word in Old French, which itself evolved from the Latin gigeria, meaning giblets. Birds swallow food and store it in their crop if necessary. Then the food passes into their glandular stomach, also called the proventriculus, which is also sometimes referred to as the true stomach. This is the secretory part of the stomach. Then the food passes into the ventriculus (also known as the muscular stomach or gizzard). The gizzard can grind the food with previously swallowed stones and pass it back to the true stomach, and vice versa. Bird gizzards are lined with a tough layer made of the carbohydrate-protein complex koilin, to protect the muscles in the gizzard. All birds have gizzards. The gizzards of emus, turkeys, chickens and ducks are most notable in cuisine (see below). In Mexico they are eaten with rice or with chicken soup. 1 2 "Gizzard". Merriam-Webster Online Dictionary. Retrieved 2009-02-05. ↑ John Hudson Tiner (12 January 2009). Exploring the World of Biology: From Mushrooms to Complex Life Forms. New Leaf Publishing Group. pp. 115–. ISBN 978-0-89051-552-5. Retrieved 17 October 2012. ↑ K. Sakai (2004). 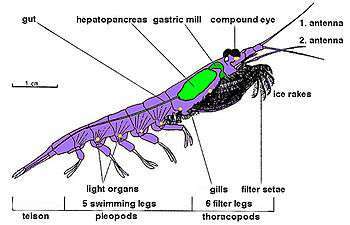 "The diphyletic nature of the Infraorder Thalassinidea (Decapoda, Pleocyemata) as derived from the morphology of the gastric mill". Crustaceana. 77 (9): 1117–1129. doi:10.1163/1568540042900268. JSTOR 20107419. ↑ "Gizzard Fest". Potterville Chamber of Commerce. Retrieved 2009-02-05. ↑ Victor Mair (2015), Chinese words and characters for "gizzard", Language Log, 7 January 2015.